Put a funny face on it! I'd love to draw for you! It couldn't be an easier or happier experience! I've enjoyed doing all kinds of projects for a huge number of satisfied customers during the past 50 years. And I would be happy to do a project for YOU! 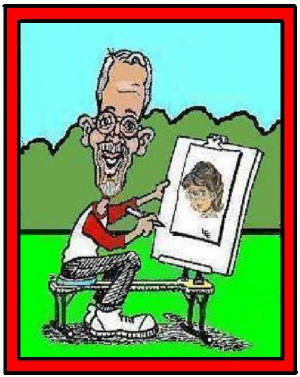 I draw caricatures and cartoons for use on business cards, letterheads, advertisements; caricature posters for birthdays, graduations, weddings, anniversaries, promotions, retirements, and the like. I also have fun with people's faces at parties, picnics, wedding receptions, school carnivals, and other events. A proud member since 1993 of the National Caricaturist Network, our trade association, I have gained a lot of good experience working with fellow caricaturists. The NCN currently has approximately 500 members who are scattered all across the USA and Canada, and in nations around the world, including Japan, Korea, Australia, the United Kingdom, Ireland, Belgium, Germany, Spain, and others. Our organization brings caricature artists together at annual conventions, where we learn from one another and from nationally-known professionals. In the past few years, I've had the privilege of attending conventions in Orlando, Atlanta, and Las Vegas, and I was able to attend the October 2006 NCN Convention, which again was in Orlando. We had a great gathering, with nearly 200 artists participating. It was my 5th convention... and the organization's 15th. And... as you might expect... now I am looking forward to next October when the NCN will convene in Reno, Nevada. You can find some information about me by visiting Tad Barney's helpful web site, called The-Nose. CLICK HERE to visit the NCN web site. This was our NCN logo in the 1990s. In those early years, we were a "National" body... but as our new logo, above, indicates, we have become an "international organization." Please get in touch to place your order or offer comments!